I've heard the world-building in this is severely lacking. I'm an easy to make emotional reader too, so if I don't have a reaction, that says a lot. Like Andrea, I've hear that the world-building in this series doesn't work very well, I am happy to see that despite that you were able to enjoy it quite a bit. This series has always intrigued me because I absolutely adore the covers! Great review, Siiri! I'm glad to see that you gave this book a try despite the not so praising reviews. I usually need a first book in a series to completely wow me in order for me to want to pick up the rest of the series, but I can understand the authors slow world building in this book. I am however intrigued by the characters and whose side you were on over this love triangle. I'm also glad to see that you're still excited about giving the rest of the series a go, I hope it lives up to your expectations. Lovely review! You're probably the only person I know who liked Aspen better than Maxon. That's why I have no interest in continuing this series because I'm 100% sure she's going to end up with Maxon. I was bored with him as well and I never understood the fascination with him. He is a nice guy though. Anyways, the world-building wasn't great, but I did like it better than a lot of other readers. If you read the next book, let me know how you feel about it. I quite liked this one Siiri, but you do make some good points. 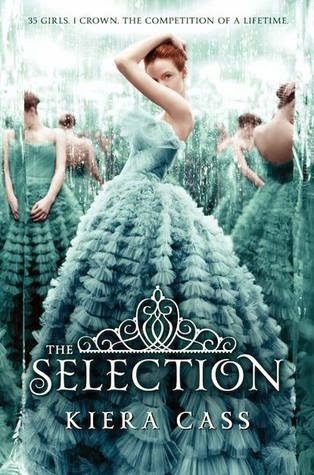 I wasn't overly drawn to Maxon in the beginning, but he grew on me throughout and I was rooting for him in the end. I ran into a lot of trouble in The Elite though, so I'm definitely curious to see how that one works for you! Those covers though? *dies* So absurdly pretty. The cover of The One is definitely my favorite. Love that white dress! This one was light and fluffy for me. I agree that the world building was lacking. I had a lot of problem with how black and white the caste systems were, and the technology aspect confused me. I wasn't sure whether to picture something historical without toilets or something with tons of gadgetry (since, hey, they are filming the whole thing for a show). I was so Team Aspen too! I thought she had more sexual chemistry with him. Maxon seemed like a friend. I didn't read the sequel, but my sister LOVED this one and read The Elite. She was really, really disappointed with it. So I'm prob never going to read it. I figure, if she liked this one and hated the other one, there's no hope for me. But you may enjoy it more :) As always, great review, Siiri! A love triangle and simple world building is a bad combination for me. Plus I am not at all a fan of the bachelor. However, I do have a lot of friends who love this one and hope the series gets better for you! I'm definitely interested in your reaction to The Elite. Honestly, I think that there wouldn't be that much negative reviews if there hadn't been all that drama. It was okay read for me, nothing special but fun way to spend boring evening. This series seems like a guilty pleasure more than anything. I get why you said it was too simple because not a lot happened in it, but then again I only saw that 2 minute barbie made by epic reads. Lol, that video was actually really good! But I don't think I can sit through the whole story and not be bored by it. I'm surprised you picked Aspen because a majority of the readers preferred Maxon. Ah, but who am I to say? I always root for the other guy. I have a feeling I might end up reading this series sometime next year because I love weird, cheesy romantic stuff like this. Great review, Siiri! These covers are gorgeous! Unfortunately, most of the reviews I've seen from trusted bloggers have been just meh. The fact that her name is America Singer is what makes me not want to read this...I'll just stare at the pretty covers.